It’s peach season at last! This summer stone-fruit, perhaps more than any other, denotes simple perfection. Is it any wonder we’ve coined phrases like, “She’s a peach,” and “peachy-keen” to draw loving comparison to this fuzzy-skinned favorite? I adore peaches. I bide my time through winter and spring, marking the slow progression toward summer stone fruit. With the onset of warm weather, I await the arrival of peaches at market with an impatience that borders on obsession. In this case, absence certainly makes the heart grow fonder. When I’m finally rewarded with that first bite of ripe, juicy flesh, I know the wait has been worth it. With several hundred varieties grown, there are peaches to suit every taste with an impressive selection of both yellow and white fleshed fruits available. The season kicks-off in late May, peaks in June to early August, and can run as late as October. 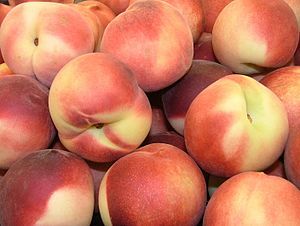 Perhaps the most basic difference between peaches has to do with their seed or “stone”; clingstone peaches have fruit that adheres to the pit, while the flesh of freestone varieties easily separates from the seed. Most fresh peaches found at market will be freestone. The majority of canned peaches you buy are clingstone varieties. Where taste is concerned, yellow-fleshed peaches can run the gambit from tangy to sweet depending on the acid content of the fruit. The higher the acid, the stronger the “peach” taste. Personal favorites in this category include O’Henry, and the lesser known antique Rio Oso Gem, both available at farmers markets in early August. White-fleshed peaches tend to be more delicate, both in texture and flavor. Their generally low-acid content can taste a bit bland compared to yellow-fleshed varieties. Their flavor is sweet on the palate, but not necessarily “peachy” in a classic sense. Nectarines, the smooth-skinned kissing cousin of the peach, also come in yellow and white-flesh varieties. As a general rule, yellow nectarines tend to have slightly more acidic notes, yielding concentrated flavor with a bite. The Fantasia nectarine is a winner in this category if you can find it. White nectarines are mild and intensely sweet with floral and honey overtones. Personal favorites are Arctic Rose and Snow Queen — both white-fleshed, juicy, and delicious! With all varieties, look for fruit that is firm and gives slightly to the touch without soft spots or bruising. Ideally, a floral fragrance is desirable. The best indicator, as always, is taste. I love visiting the various vendors at Farmers’ Market, sampling different varieties and making final selections based on my preferences. I won’t buy peaches I can’t taste first, having arrived home a few times with specimens that didn’t live up to my expectations or worse yet, were mealy inside. Always opt for organic fruit when possible. Peaches and nectarines that are firm when purchased can be ripened on the countertop at room temperature for a day or two. Wait to wash fruit until just before eating. If need be, you can refrigerate ripe fruit to slow further ripening–but not for long. Stone fruit is best eaten as soon as its reached the peak of perfection. The best way to showcase this summer superstar is to let its simplicity shine through. 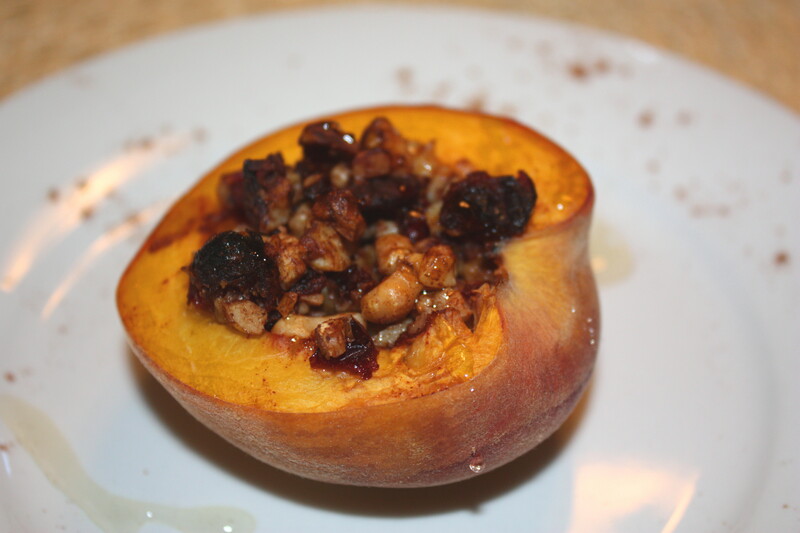 The following recipe for baked peaches comes from Certified Natural Chef Suzanne Griffin(www.cookingbythebay.com) and is a tried and true favorite of mine. It’s quick and easy preparation makes it an ideal weeknight family treat, or an elegant finale to serve to dinner guests. Either way, you’ll garner raves! Preheat oven to 350. Cut peaches in half, remove the pit, and make a small well in the center using a melon baller. In a bowl, combine walnuts, cranberries, cinnamon, and nutmeg. Add syrup, stirring to coat the mixture. Fill each peach half with the nut mixture. Place peaches on a baking sheet lined with parchment paper on the center oven rack, with a shallow oven-proof bowl of water on the rack below. Bake for 15-20 minutes until soft. Remove from heat and drizzle with honey. *I like to add a tablespoon or two of Strauss Creamery Cinnamon or Maple Syrup Yogurt to the plate and set the baked peach on top … super yummy!